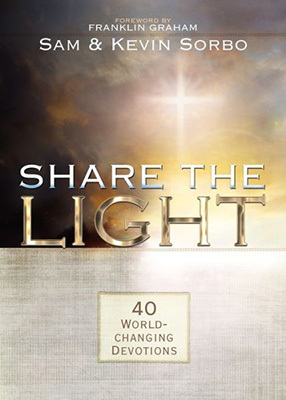 After the success of the movie, Let There Be Light, the devotional Share the Light, was born. It takes readers deeper into the Word of God, examining the power of stories and why Jesus chose to communicate with parables—stories that teach profound truths. Themes like family, fatherhood, atheism, faith, forgiveness, grief and redemption are found within the devotional. You will also find references from the movie, devotions, scripture, and questions which encourage reflection and discussion. Forty challenges inspiring us to serve others act as a catalyst for changing the world around us. The Sorbo’s explain, “Let There Be Light was, for us, like planting seeds. Now we would like to water those seeds with the ideas in this book, to encourage you to flourish both in your faith and in your actions.” They encourage others to share their stories on their social media campaign #LTBL so people can easily find encouraging stories of others taking action to make a difference. Let There Be Light is a movie about an atheist, Sol Harkins, played by Kevin, who experiences a near-fatal experience. As a result, he converts to Christianity. Sam also starred in the movie which released October 27, 2017. For more information, please visit www.LetThereBeLightthemovie.com. Sam grew up in Pittsburgh, PA and studied biomedical engineering at Duke University after high school. She moved to Los Angeles to pursue a career in modeling and acting and landed roles in several films and TV shows. Sam guest starred in the hit TV series, Hercules, in 1997 opposite Kevin Sorbo. It was love at first sight! They married in 1998. Both Kevin and Sam have been successful in Hollywood. Kevin has acted in more than 40 movies and TV shows. Sam pursued her career in acting and modeling. When her oldest started public school, Sam realized he was not learning the same values as they taught in their home. “Your kids are a gift from God,” says Sam. “Why are you putting him or her in an institution for 8 hours?” Sam believes children are here to teach parents. She has since become a huge proponent for homeschooling. “We do not ask schools to teach anything related to God,” says Sam. “So how will godly values enter the classroom?” Sam believes all education starts at home. SHARE THE LIGHT After the success of the movie, Let There Be Light, the devotional Share the Light, was born. It takes readers deeper into the Word of God, examining the power of stories and why Jesus chose to communicate with parables—stories that teach profound truths. Make a Difference in Your World! Jesus spoke in parablesstories to teach truths with profound meaning.